Although it’s technically been Spring now for five weeks, the green season has not really hit our backyard yet! Lots of brown mulch and many sprouts with a promise of future hostas and ferns, but not a lot of colour. 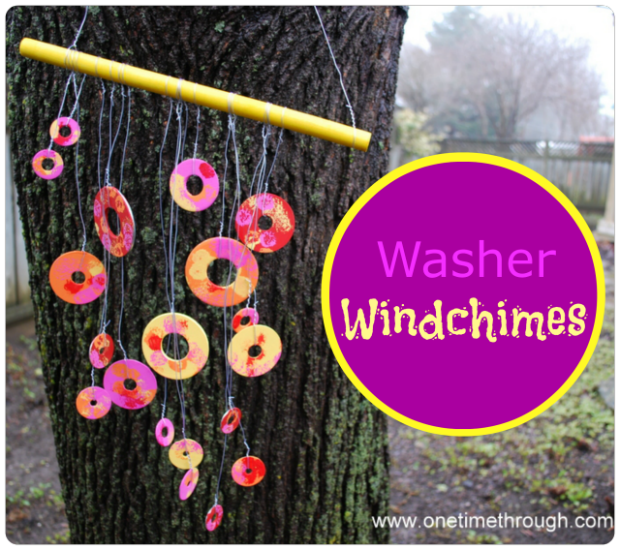 So Onetime (my 2.5 year old son) and I decided to brighten up the back garden with some painted homemade washer wind chimes! 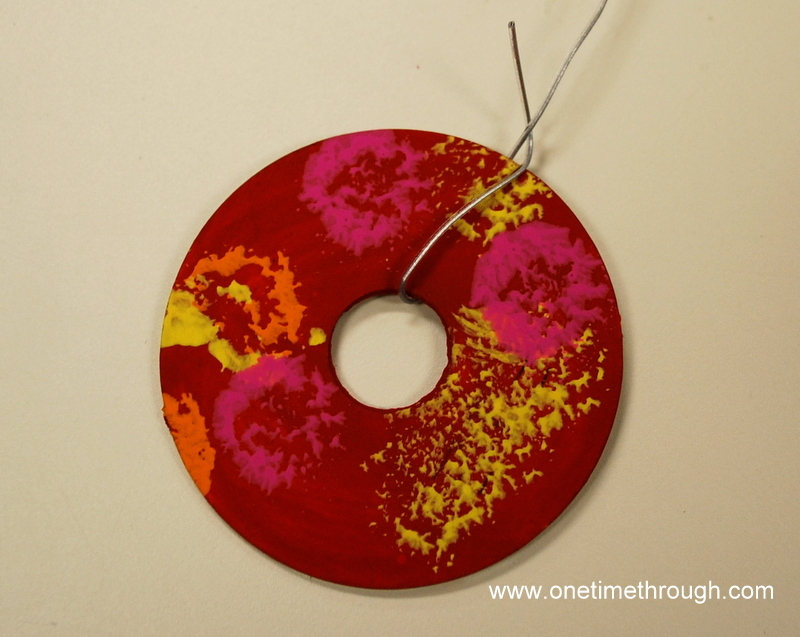 After Onetime chose the colours he wanted to use, I painted a base coat of the 4 colours on several of the washers. Older children could do the base coat painting themselves. Oh, and we chose to stick to the warm colours of the colour wheel (reds, pinks, oranges, yellows) so it would feel springlike! And we painted the side with the washer code numbers on to cover them up. 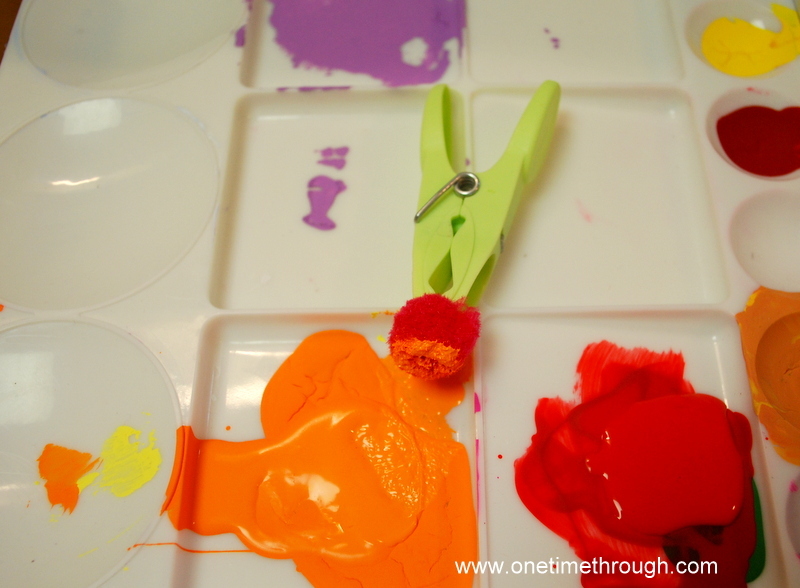 For each colour of paint, create a pompom paint dabber by pinching a pompom with a clothes peg. Show your child how to dab and let them paint! paint! paint! Here are our finished washers! Aren’t they pretty? I almost felt like these glued onto a piece of paper could be art enough! We only painted one side of the washers so that the silver side would shine in the sunlight, but you could do both sides. 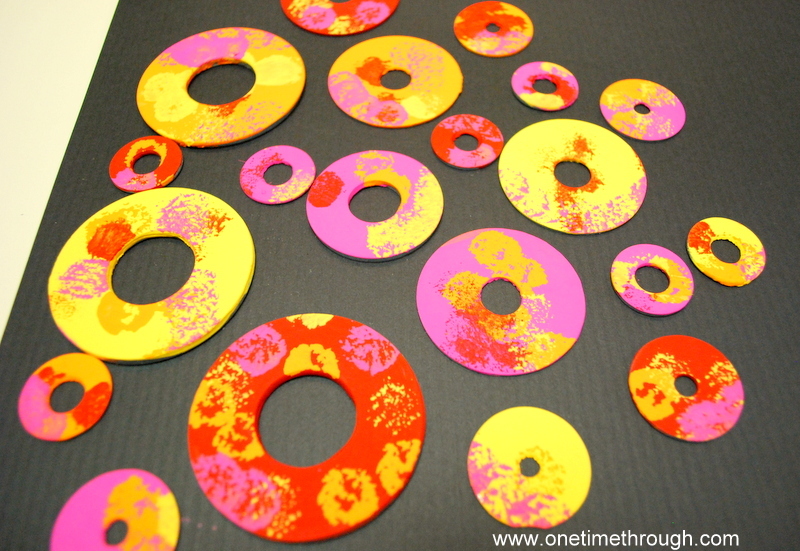 After the paint was dry, I sprayed the washers with a matte finish waterproofing spray from the local craft store. 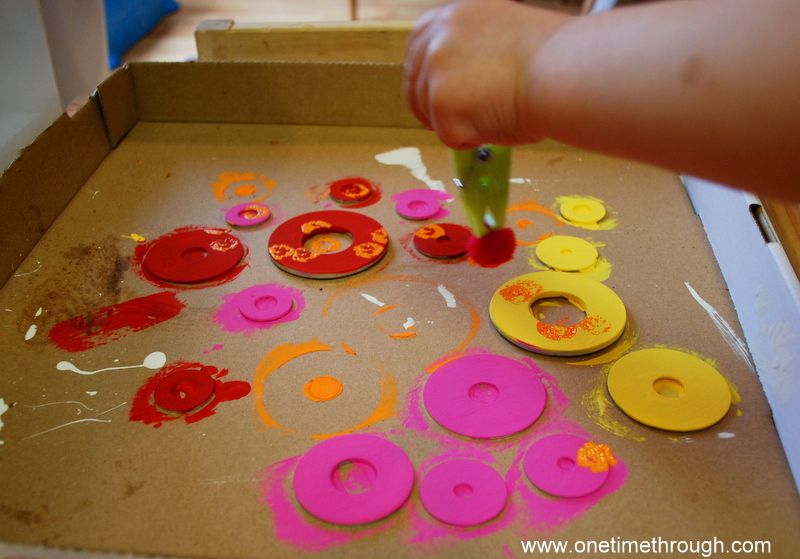 Arrange the washers in an attractive arrangement on a flat surface below your dowel or stick. 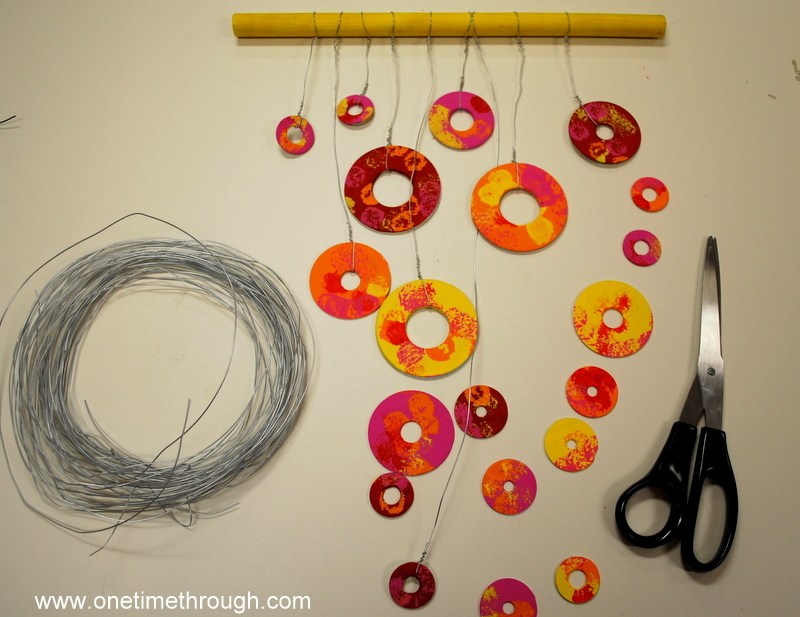 Start cutting lengths of wire that will attach each washer at that spot. To tie each washer on, just feed the wire through the centre of the washer and then twist. Do the same at the dowel end. 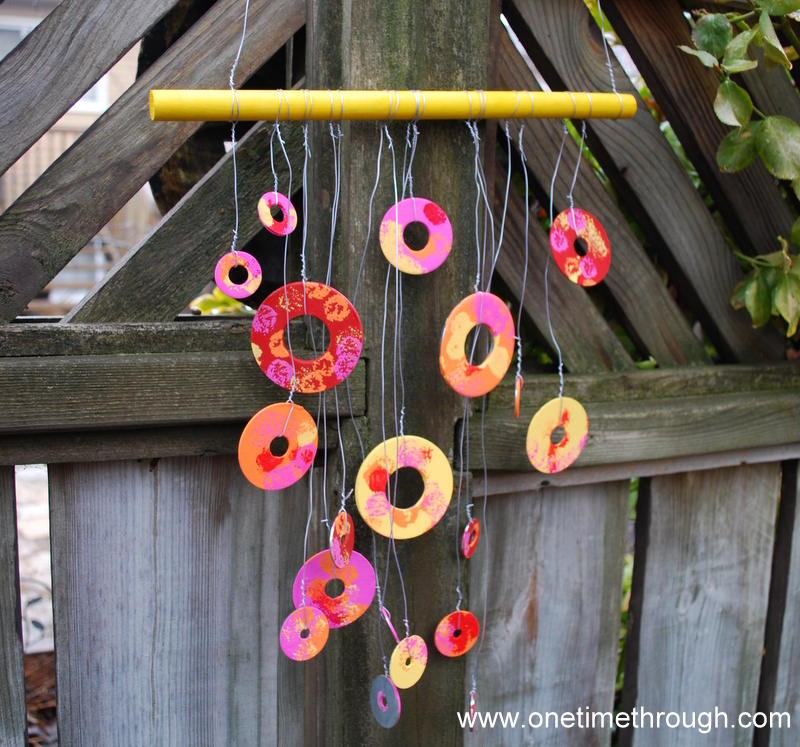 Find the perfect spot in your garden for these sweet tinkling wind chimes! To be honest, I wasn’t sure how these were going to sound when I came up with the idea – but they have a beautiful tone! Yay! Bonus. Today’s post was definitely more craft than art, but Onetime was really proud of the painting job he did and I think he will admire and enjoy these in our backyard, as will I, for the rest of the season! This looks like so much fun to paint!! And I love the colors you chose! They are definitely bright and put you in the spring spirit! Thanks Ninjastitches! 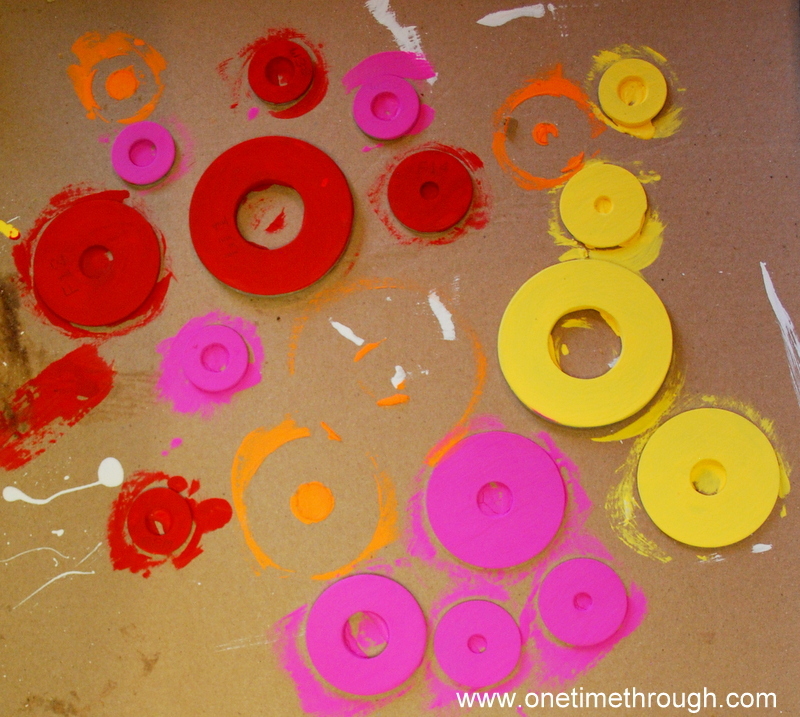 I think we’ll try experimenting more with the pompoms for painting – they ARE fun! Thanks for dropping by! Great Idea Sue! Love this one! Keep ’em coming! Thanks Christine! They sound really pretty too! Thanks for following!